When I started consulting in risk and safety, people would regularly contact me and ask “are we meeting our legal requirements?” or “are we doing all we need to do, ‘under the law’”. Consulting in risk and safety seems to attract these questions, and people expect that this is an area I am interested in. After all, if you’re into safety, you must be focused on legislation, right? When an organisation focuses only on legislation and rules, people are often treated as objects within a system. This is because the focus often becomes about the system and perfection and there is little understanding of how people make decisions and judgments. This may actually increase risk in an organisation because people work out of fear rather than understanding; follow process rather than thinking creatively; and are more concerned with perfectionism than learning. This is why I’m not that into Safety anymore. Some organisations are so fixated on meeting their legal requirements (and obeying ‘the system’) that they become blinded to the impact that this has on culture. Companies that focus their attention solely on a ‘system’ create a culture that demands obedience, in what I refer to as an ‘Obeyience Culture’ – obedience in the name of compliance. This type of culture fosters fear, silence and blame; all of which lead to organisations where surprises are the norm, and unusual events appear from nowhere because people in those organisations do not reports mistakes, near misses or ‘oh dear’ moments. This is because this type of reporting is not how things are done in an ‘Obeyience Culture’ for fear of reprisal (blame, loss of bonuses, safety awards etc). So why do these organisations require obedience? The reason is that leaders in such organisations believe that obeying instructions, following directions and adhering to rules is what the law requires. You will hear such leaders say things like “we just need clear guidelines, standards and processes, and people who will follow them”. Such leaders are treating people like robots expecting that they should do everything that is asked of them, without question. Rules are there to be followed. In one recent organisation that I heard of, they developed ‘Sensible Standards’ that had to be followed, and they expected ‘uncompromising compliance’ (which meant a first and final warning if you didn’t follow the standards) from everyone. They told their front line supervisors (that to make it easy for them), that the supervisors had no discretion when it came to their people ‘breaking’ the standards. They were expected to punish people, no questions asked. The site leader added, ‘we are doing this to save lives; that’s what we are about’. I’ve become attuned to words like this, and I now listen for the discourse of these words. Words like this are a sure sign that this was an ‘Obeyience Culture’. The irony is that organisations with an ‘Obeyience Culture’, do not deal with risk as we well as organisations with ‘learning cultures’. ‘Obeyience’ creates an environment that is structured, fixed and difficult to change (see Chapter 23). ‘Obeyience’ cannot entertain critical thinking because it cannot entertain being wrong. ‘Learning cultures’ instead provide an environment that is full of critical thinking and of challenging ideas and practices. They are nimble, creative and resilient. So organisations that strive to meet legal requirements and deal with risk through obedience, may well just be doing the opposite, because in those organisations people cannot learn and when they make mistakes, they must be punished. So why are organisations and leaders seduced into thinking that an ‘Obeyience Culture’ will help them meet their legal requirements? The seduction comes from the belief that employees obeying rules means that they, as leaders, are doing what the law requires them to do. This is often what is portrayed in various legal briefings and advice that is distributed to organisations and managers. We are constantly being advised that we must have and review policies, procedures and standards and we must create a culture where people follow them – ‘Obeyience’. I understand why it is tempting for some leaders to focus on developing an ‘Obeyience Culture’, however I wonder though whether they stop to consider the by-products and trade-offs that are created by fostering such a culture? The by-products and trade-offs include silence and under-reporting; no one wants to bring bad news or to highlight mistakes (breaches of ‘the rules’). However, there is a greater concern that leaders should be aware of, which is the power that they have over people and their behaviour when their focus is on obedience. Milgram (2009) highlighted this in his social psychological studies in 1962 in which 40 people, all males, participated in an experiment that demonstrated what ‘ordinary’ people will do to each other when they are operating under the authority of another. In his experiments, Milgram had actors, who were dressed in white coats to demonstrate authority, issue instructions to some of the participants to administer electric shocks to other participants when they answered incorrectly to questions they were asked. As people continued through the test they received increasingly higher doses of electric shock each time they answered incorrectly (https://www.youtube.com/watch?v=fCVlI-_4GZQ accessed 5th July 2016). The people, who were receiving the supposed shocks, were not really strapped up to the electricity, but those who were administering the shocks believed that they were. They were told ‘they will learn more, because they get punished when they make a mistake’. Of course, this was not the case at all; there was no learning for the participants who were receiving the supposed electric shock; the real learning related to how far people will go, and what they will do, when a person who is perceived to be in a position of authority, administers a command. Milgram’s experiment provides a fascinating insight into the power of authority, and demonstrates just how obedient people will be, even when they feel uncomfortable, and don’t want to do what is asked of them. So what can we learn in risk and safety from Milgram’s experiments, and what do they mean for organisations with an ‘Obeyience Culture’? There are two key lessons for leaders to consider. Firstly, leaders should be aware and reflect on how their own authority and style may impact on the people they are leading. This can often be a difficult thing to detect. After all, if their style is to issue instructions and people always seem to follow these instructions, they may think everything is going fine. Of course, if this is done in the social context of an ‘Obeyience Culture’, they will not hear from their team when things go wrong, because this is not the way things are done in an ‘Obeyience culture’. A lack of honest feedback is another by-product of an ‘Obeyience Culture’. If you are a leader and you rarely hear of problems, mistakes or errors from your team, you should be concerned that you may have created an ‘Obeyience Culture’. Secondly, leaders need to be aware of and reflect on the overall culture of their organisation. Leaders in an ‘Obeyience Culture’ may themselves be fearful of the ramifications of not meeting their legal, head office, regulator or other imposed requirements (their due diligence). The irony is that the leaders themselves may be blinded or at least mislead by Obeyience. In the ‘Obeyience Culture’ we will hear reference to ‘due diligence’. We hear people saying (and rightly so) that we have to demonstrate due diligence. But when we hear this we are usually drawn to a six-point checklist, which someone has extrapolated from The Act, and we hear them say that by checking off the points on this list you will be able to demonstrate due diligence. Due diligence, has got a lot of noise lately in the safety space… I’m absolutely convinced that the way it’s being flogged around the safety industry fundamentally misrepresents what due diligence is about. I think it also represents the real lack of critical thinking that we see in the safety industry. Safety legislation. So, demonstrating due diligence is focused on doing; it is an activity thing. So what does demonstrating due diligence really mean? Being diligent requires ‘Officers’93 to go and look, question and understand what is going on in their business. It requires ‘Officers’ to enter the workplace and actively interact with the people conducting the work. It also requires ‘Officers’ to understand about (not just be aware of) the risks that they (actively) know are present in the business and that people are engaging with. The ‘Officers’ understand about the risks because they are diligent (persistent and hard working) in their risk understanding activities. They are diligent in their active pursuit of these activities which include: active questioning, active listening and active understanding. Further, demonstrating due diligence is also about being able to (actively) confirm that ‘what is going on’, is actually what they agree is ‘what ought to be going on’. It is actively confirming that what the human, fallible, error prone people conducting the work, understand the policies and procedures are saying is what they (the Officers) deem are the most appropriate ways to manage the risks that they (actively) know are present in the business. And they know this because they are active in finding out from these same people what those most appropriate methods might be; including actively ensuring ‘as best they can’ that these same people have the necessary resources (skills, knowledge, well-being, support, equipment, etc.) to discern and manage the risks. But wait…. there’s more: demonstrating due diligence is also about being active in knowing when the unexpected happens (what Weick and Sutcliffe (2007, p. 12) call having a “sensitivity to operations”). Again this means that ‘Officers’ actively engage with people to learn about what is ‘really’ happening, as opposed to what they ‘hope’ is happening. And most importantly it is about: stopping, reflecting (as individuals and collectively) on what has happened (good and not so) and paying active heed to experiences and learning from them. I’m reminded of Dewey’s philosophy on learning “… education’s purpose is to prepare us to survive and, hopefully, flourish in a future that is by nature uncertain.” (Dewey, cited in Hildebrand, 2008, p. 125). If you are in an organisation that focuses mainly on LTI’s, risk assessment scores, completing checklists, counting ‘safety observations’ and ‘zero harm’ and little focus on understanding people and motivation, and no acceptance of mistakes; and you think that demonstrating due diligence is about ticking off boxes on a checklist; it is likely that you have an ‘Obeyience Culture’, or you are on the path to developing one. So what do leaders need to be aware of in order to avoid an ‘Obeyience Culture’? What words are used by leaders across the organisation and what is their discourse (or trajectory)? Words like ‘uncompromising’, ‘must do’, ‘no discretion’, ‘zero tolerance’, ‘absolute expectation’, ‘we are serious’ and ‘no room to move’ can all be signs that the organisation is focused on ‘Obeyience’. What language is used in organisational policies and procedures? Is it focused on words like ‘compliance’, and ‘adherence’, or instead on learning, acceptance of error, and an open culture of listening and ‘humble inquiry’? How are people rewarded and recognised? Is the focus on injury numbers (lag indicators), or effective conversations (lead indicators, or preferably, not measured at all)? How are incidents dealt with? Is an incident, near miss or hazard report seen as a failure, or an opportunity to learn? When the unexpected happens, what is the first question asked? If it is “who did it?” instead of “how can we learn from it?” – then you may have an ‘Obeyience Culture’. How is the demonstration of due diligence seen? Is it an ‘activity’ as in a “persistent and hard-working effort” to understand that ‘what is going on’, is actually ‘what ought to be going on’ in order to discern and manage risk? Or is it a desk top audit process governed by a 6-point checklist? Of course, understanding organisational culture is a far more complex task than simply considering these few questions, but they are a good starting point in understanding whether your organisation has, or is on the journey to an ‘Obeyience Culture’. 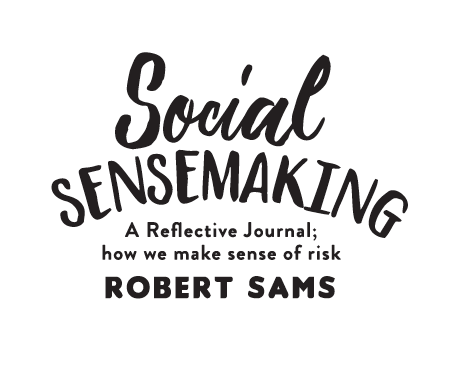 So, how may you go about impacting on your organisational culture to make it more focused on supporting people to discern risk, rather than on trying to control behaviours? 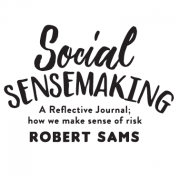 *This is a free Chapter from the book Social Sensemaking by Robert Sams which can be ordered by clicking HERE.